The moral right to the author’s work herein is asserted by himself, namely Shaye-Alexander Ellis Nicholls of Merridonia. Merridonian copyright or Copyright of those of Merridonia is without limit, and those of Merridonia are those that have been accepted by the author and stated to be so accepted by the author. Merridonian copyright requires acceptance by the author. Trademarks herein are Merridonian trademarks of the author. Merridonia is a private world by invitation of the author only. With regard to A Lacework of Strands by the author – Shaye-Alexander Ellis Nicholls (SAE Nicholls), as with all parts of A Leap of Recreation™ and all and any additions to them there can only ever be the granting or the agreement of or for short-term temporary permissions and never long-term or permanent rights or agreements or contracts of any kind, and interpretation of all aspects herein and related to is the reserved right of the author. The author has full valuation and revaluation rights in all matters relevant to his work and has the right to decide what matters are relevant to his work. There are many what are called card games or paper games as some would classify those here but I would like to think they are something more than just this…..unlike almost all of the games of Steps along the way of Chess there is a definite element of luck involved in a single game of those that follow - but then, for some, this can make the game more enjoyable in some ways to those of Steps and there is little in the way of pieces moving on a board and so A Lacework of Strands can perhaps be thought of as companion and complementary games to Steps. The basic rules of Blade and Revolver are mostly fairly easy to learn and a round of play for them does not take too long whereas Flagship has more complex rules and a game could take up to several hours. But whatever the differences between the two books of games they are both intended for playing enjoyment for those of all levels and not just experts. A Lacework of Strands can be referred to as Lace or Lacework. Interpretation of game rules is the reserved right of the author (SAE Nicholls). Were A Lacework of Strands to be in book form the presentation would be of a professional standard and not that of an MS Word document as it is here - unfortunately one is limited by such things, but A Lacework of Strands is very much a work in progress and subject to changes as the author sees fit, and the section on Further thoughts gives an indication of this. Referees of Flagship may offer the service of moving pieces (helpful if the board is very large), or assist with rules or the settings of clocks etc. and they can enforce the spirit of a game. Points scored are called Satellite game points or Satellite nominal points to distinguish games in A Lacework of Strands from others, but this is for a future time when.....(currently as Background and Representation).....they will have an official certificate issued (with registration) that will be exchangeable with currency of Merridonia and with the exchange rate for Satellite nominal points initially set at 50% of that for Satellite game points; but the issuing of official certificates for Satellite game/nominal points must be authorised by myself (Shaye Nicholls) and it is not likely they will be so until the future and so for the present time points scored may likely carry no meaningful value - note that there is no right of exchange between Merridonian currency and other currencies.....But, for comparison purposes, how much would a Satellite game point be worth compared to a Western chess point of today (2019).....Well.....I have done a calculation that perhaps gives a very blunt average measure of around 150 GBP at today's values for a Western chess point and this is set out in Steps along the way of Chess.....(another Evergreen – the second, with A Lacework of Strands being the third, as parts of A Leap of Recreation™ are known; the first Evergreen is a story influenced by the JRR Tolkien books of the Silmarillion, the Hobbit and the Lord of the Rings, but this is a long way from completion - see Further thoughts - various, and there is also a short fourth one on Fishing that may become longer, and perhaps a fifth one, but this fifth one is a rather vague and far off possibility only).....To return to points valuation.....what then would be the (very blunt measure) average value of a typical official Satellite game point.....Well.....I would hope for something very much more than this but for this to happen the presentation of the Lacework games would have to be much more interesting and colourful than they are in their current various forms. The game of Blade is based on whist and contract bridge. Whilst there are simplifications in the bidding and scoring of the game to that of contract bridge, there is a new feature called the Balancing Point and this hopefully adds an elusive and interesting challenge to the game – this feature is explained later. Much of the game’s rules follow those of contract bridge and so Blade is explained mainly by comparison to this. Blade can be described as a Fulcrum game. In a future time it has been realized that even in (or particularly in) games of all kinds things should be what they purport to be or shown otherwise, and that rewards should be based on merit more than luck, and also that complexities require rhyme and reason; and so Blade has become popular indeed amongst games based on Whist or Bridge, where Bids are what they say they are and the Balancing-point must be kept in mind whilst Bidding, and where strong (lucky?) hands do not simply or easily lead to runaway scores. The broad object of the game of Blade is, like many Whist-based games, to win as many Tricks (Rounds) as possible and to make scores that build towards an overall winning score. Note - The above is the ranking of Regions (suits) for Blade and in contrast to Contract Bridge no Crests (no Trumps) is lowest for bidding purposes. A Bid to win a certain number of Rounds means precisely what is said, and so a Bid of seven Lakes means that the Bidder has proclaimed to take seven Rounds with Lakes as Crests. There is no upper or lower limit on the number of Rounds that can be Bid i.e. from one to thirteen inclusive, or a player may decline to bid, though he can return to the bidding later. More is said in the general rules section about the ranking of Bids and so forth. One Blade-mark is awarded to the Proclaimer’s partnership for winning the proclaimed number of rounds and in addition one Blade-mark is awarded for each round-over to the Proclaimer’s partnership. If the proclamation is not reached then one Blade-mark is awarded to the defending partnership for each round-under. Upon a Partnership reaching a minimum of six Blade-marks and leading by two or more Blade-marks, or failing this the first Partnership to reach fifteen Blade-marks, then a Holding (of Blade-marks) is made (won) and a new holding begun – any excess Blade-marks (over the minimum required to make the holding) are carried forward to the new holding except when the game is concluded. The game is concluded when a Partnership makes three holdings, and if their opponents have not made a holding a bonus holding is awarded. The game scores can vary between 4-0, 3-1 (2-0 if netted) and 3-2 (1-0 if netted) in holdings to the “Game-winning Partnership” as they are called. The scoring in Satellite Game points for the Game-winning Partnership is one for each netted holding as explained above and so is four, two or one point(s) and is shared between them as they agree between themselves. The losing Partnership does not receive any points. Note - The awarding of one Blade-mark for winning the Proclaimed number of Rounds is not one Blade-mark per Round won e.g. if the Proclamation is ten Lakes then the winning of ten Rounds by Proclaimer has one Blade-mark awarded, whilst the winning of eleven Rounds would here have two Blade-marks awarded – an additional one for the Round-over. Also in this example if only nine Rounds were won then the Defending partnership would be awarded one Blade-mark for the Round-under. There are four players at a suitable Table in two Partnerships designated as North-South and East-West though names can also be used and North-South can mean Proclaimer is South. The last player to Bid is Proclaimer and this Bid is the Proclamation. Proclaimer’s Partner is called The Lookout (see variation below). Proclaimer plays The Lookout’s Blade-hand (see variation below). Defenders are the Partnership not holding the Proclamation. The Bidding ends when three players have declined successively after a Bid. Play of Blades is in a clockwise direction. The lead on the first Round is by the Defender to Proclaimer’s left. The Lookout must turn his/her Blades upright after the first Blade is played (see variation below). Players must follow Region if able to do so. A Round is won by the highest Crest played, or if no Crest is played, the highest Blade of the Region led- this would also apply to a no Crests Proclamation. A Bid must be higher than the previous Bid. Bids rank first according to the number Bid, and second according to the Region designated as Crests or no Crests. There is no doubling and so no re-doubling. The Winner of a Round must lead to the following Round. Partners may be determined by agreement or by a draw of Blades where number ranks high, followed by rank of Region. Dealer is determined initially by a draw of Blades where number ranks high followed by rank of Region. The deal then passes to the player on the left of the current dealer thereafter. The Set must be shuffled/cut at all appropriate times. Also fresh and sealed Sets should be brought in at regular intervals. The player to the left of dealer has the right of first Bid. Bidding takes place in a clockwise direction. Should all the players decline to Bid, they must proceed to the next deal. Clocks are not usually used, though in tournament or match play players would be expected to state their Bid, decline to Bid or play their Blade etc. in no more than one or two minutes or so. Should a player persistently exceed this time, then it is in order for an opponent to insist that this guideline be followed (see Further thoughts - Various). Two Sets of Blades should be used with a wildlife design on their backs. Designs are shown on both halves of the front and back of Blades. The Set of Blades listed earlier is called the Royal design Set. If all four players agree then Proclaimer’s partner does not turn his Blades upright and plays his own Blades. If this variation (called Four-handed Blade and the usual variation would be called Three-handed Blade) is chosen it must be played throughout the Match. Bidding, scoring etc. is the same for Four-handed Blade as with the standard Three-handed game. Players who prefer Four-handed Blade may form established partnerships and then games.....(or tournaments - sometimes called drives, these can of course also be played with Three-handed Blade. Tournaments are talked of in Further thoughts - Various).....can entirely consist of such partnerships, but if the game is simply called Blade this would be assumed to be Three-handed. As can be seen, both Partnerships would want to hold the Proclamation below the Balancing-point, but above the Balancing-point both Partnerships would want their opponents to hold the Proclamation. In the above example all the players were assumed to know the whole situation, but in a game of course this would have to be deduced from the Bidding, and the Balancing-point would be a matter of judgement and could change according to the Bidding. The Bidding could also be subjected to disruptive Bids and bluff and counter-bluff. It is just possible (e.g. being 5-4 Blade-marks ahead in a Holding), after Playing a Blade-hand, for the current Holding to be made and for the carrying forward of excess Blade-marks to be sufficiently large (six) to then also immediately make a further Holding, but this would be very rare indeed. Such a happening is called a Sonic-boom. This could be considered as the equivalent of a Grand Slam in Contract Bridge and would require a Blade-hand of at least this sort of calibre, but has additional rarity and difficulty due partly to the Holding score situation needed to bring this about and also due partly to Balancing-point possibilities and complexities. A Sonic-boom would consist of seven Blade-marks awarded by a winning of all the Rounds, though either Partnership could hold the Proclamation. Note that the key Bidding level for this is seven (the Blade type of seven that is, not the Contract Bridge type of seven). To restate: A Sonic-boom means a Partnership makes the current and next Holding. This is the same as a Sonic-boom except that a further Holding is not also immediately made (due to the current Holding score situation). As with a Sonic-boom seven Blade-marks would be awarded by winning all the Rounds and also as with a Sonic-boom either Partnership could hold the Proclamation. The key Bidding level for this is seven. A Shock-wave guarantees a Partnership makes the current Holding. This is similar to the above but only requires there to be awarded six Blade-marks by the winning of twelve (or all) of the Rounds and again either Partnership could hold the Proclamation. This could be considered the equivalent of a Small Slam in Contract Bridge. The key Bidding levels for this are from six to eight. A Quake guarantees a Partnership is at least ahead in the current Holding. It is possible for a Partnership to be awarded more than seven Blade-marks but this requires the unwitting “co-operation” of the losing Partnership and so is not considered in the above. The manoeuvre known as Entry to Dummy in Contract Bridge is in Blade called Crossing the Drawbridge. If just called Blade the Three-handed random variation would be assumed. The card game of Revolver is based on the games of Poker and Brag. The rules broadly follow these games but there are differences as indeed there are in the considerably different variations of Poker, though Brag with hands of only three cards has a more usual playing format. Revolver has more in common with Draw Poker and Brag where hands are not seen until a showdown than with Stud Poker where cards are progressively seen, and Revolver has a new and sometimes dramatic feature not in Poker or Brag and that is an Auction for what is called the Community Bullet. Also featured in Revolver is a miniature Banking System centred around what is called the Central Reserve (see Further thoughts - Name changes etc.) and this runs as part of an integrated Business game called Chamber. The broad idea of Chamber came from the bank in the game of Monopoly that in turn derives from a game called The Landlord's Game that seemingly had a part of the board marked as a Bank and was invented by Elizabeth J. Magie. It is not necessary to integrate Chamber when playing Revolver but of standard this is the case. In the future it is found that the type of game that Poker and Brag are can be represented and mostly replaced by Revolver as being the “Line of Best Fit” for this type of game and so give credence to the skill of players of this type of game by having a standard game. Revolver has hands of four cards and is seen as compact and measured whereas Poker has hands of five cards and Brag, as stated, has three, and Revolver’s new feature of the Community Bullet seems best fitted to four cards - five would have perhaps too little chance of an improvement to hands whereas three would perhaps too often do so and would lead to too much luck in the game. The basic object of Revolver is as with Poker and Brag and is to win “Pools” by having the highest ranking hand in a showdown or by being the only player left contesting a Pool or to be the only player left contesting an entire game. A further object of Revolver is, as with Poker and Brag, to maximise Margins. Poker and Brag are mostly played for money (Currency) as stakes and there are many what are called house rules, but the following are the official rules of Revolver and Chamber and the Revolver stakes are tokens (that can take the form of what are often called chips or counters) called Bullet-marks and the Chamber Currency is also token (that can take the form of paper 'game money' similar to that used in the game of Monopoly) and usually called 'Sterlings' though it is of course possible to use actual money. The official game of Revolver uses token stakes and token currency – both throughout, and integrates Chamber. Note: the Marshall is always high only and the One is always low only, and so neither are like an Ace of a current pack that can sometimes be used as high or low. Also hands like Rivers - see below, cannot connect 'round the corner' of Marshalls and Ones. The Foremost Bridge (All four Aces), that is to hold all four of the Marshalls. A Primary River (Royal flush), that is to hold the top four Bullets of a Territory e.g. the Marshall, Sheriff, Deputy and Bailiff of Forests. A Bridge (Four of a kind), that is to hold all four Bullets of a rank other than the Marshalls. For example four Nines would be called a Bridge of Nines. A River (Straight flush), that is to hold four consecutive ranks of Bullet in the same Territory other than the top four ranks. For example the Seven, Eight, Nine and Bailiff of Waterfalls. A Crossing (Three of a kind), that is to hold three Bullets of the same rank but where the fourth Bullet is of a different rank. A Stream (Straight), that is to hold four consecutive ranks of Bullet, but not all in the same Territory. Stepping-stones (Two pairs), that is to hold two different pairs of Bullets. A Gathering (Flush), that is to hold four Bullets of the same Territory but that do not run consecutively. A Match (Pair), that is to hold one pair of same ranked Bullets but two Bullets of different rank to the pair and to each other (see Further thoughts - Name changes etc.). A Fling (High card), that is none of the above and is described by its highest Bullet as e.g. an Eight Fling. Where Gun-hands are equal, then rank of number(s) and then rank of Territory is used to determine the highest Gun-hand. The standard ideas used in Poker apply also e.g. in two Gatherings the highest numbered Bullet is first used to determine a Winner, then the second highest if necessary, etc. until (if) Territory is needed to be used. 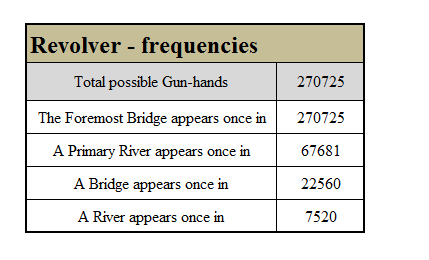 “Rarities” are collectable for the above four Gun-hands, if any appear, from each player at the Table and are twenty Bullet-marks for the Foremost Bridge, fifteen for a Primary River, ten for a Bridge and five for a River. Note - “appear” means dealt and not after the Community Bullet has been used – see later. The players and the Reservist – see below, are seated at a suitable Table (usually specially made) for play that may last up to a full day. Players are named as they so choose – the author’s would be the Reflex Kid. The number of players at a Table to initially contest a game is from five to seven, and in addition there is a Reservist (manager) of the Table’s Central Reserve. All players participating, or likely to do so, now receive the same amount of token Currency to be their (returnable) playing Currency issued from the Central Reserve but the amount depends on the likely number of games and is not sufficient to purchase the required (to commence each game with) 150 Bullet-marks for each game of more than one - e.g. for an expected three games there could be sufficient Currency received by players to purchase 300 Bullet-marks but not 450. This opening Currency balance for players and player numbers is displayed to the Table. Each player now with his Currency purchases and is issued with 100 Bullet-marks from the Central Reserve. There is also an unissued reserve of 50 Bullet-marks allocated for each player by the Central Reserve and this is also purchased by each player with his Currency. The Central Reserve acts as the Table’s bank and contains a sufficient amount of Bullet-marks for the game(s) - sometimes some thousands worth and in various denomination amounts, and there is also a sufficient amount of token Currency in various denomination amounts. Prior to commencement of play all Bullet-marks and all token Currency are held by the Central Reserve, and also sufficient sealed holsters of bullets should be held by the Central Reserve. Also prior to commencement of play, opening balances of Bullet-marks and Currency held by the Central Reserve are displayed to the Table. More is said in the General Rules section and Chamber later. 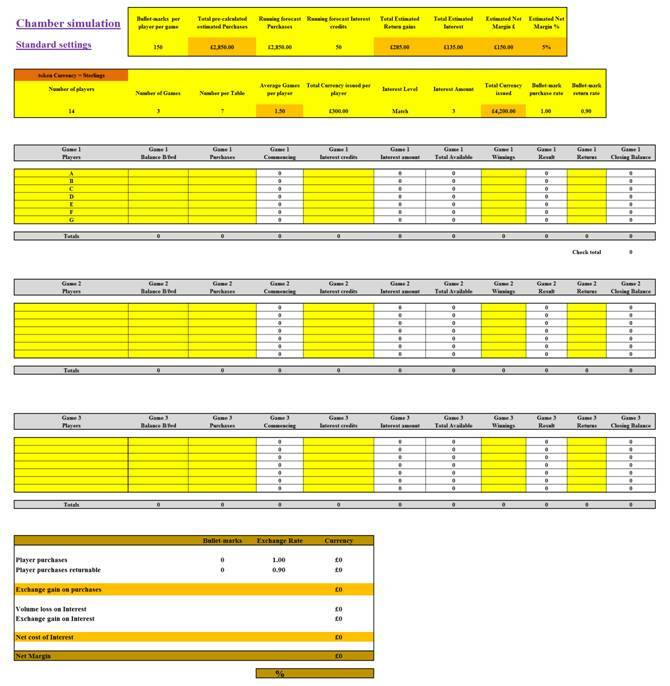 Shown later is a Chamber simulation spreadsheet. The Revolver Table - Bullet design. also included is a picture of the Ball-barrel puzzle as a basis for a Barrel – see below. The Order of play for what is called a Round consists of parts that are called “Shots”. The players, each in turn from first left of dealer, must each first “Place” five Bullet-marks to be dealt a Gun-hand. This fixed amount (called the “Entrance amount”) is placed in front of them and into their transparent “Barrel” or “Cylinder”. A player may choose to miss out a particular Round and will then simply state “Withdraw” and not place this amount or receive a Gun-hand, also the deal will “skip” over him if it would have come to him and he is called a “Withdrawer for the Round”. Withdrawing is only allowed three times per player during the course of a game of Revolver - he may stay in his Seat. A player may also choose to miss all the rest of the game and will simply state “Leave” and is called a “Leaver for the game” - he should leave the Table. A player may also have to miss the rest of the game (explained later) and will simply state “Finish” and is called “Finished for the game” - he should leave the Table. A player who has placed the Entrance amount is said "to have Entered-in for the Round" otherwise a player could be said (instead of or as well as the above descriptions) "not to have Entered-in for the Round"
Note: Leavers and Finishers are not barred from the Table’s next or further games. Each player in the Round is dealt four Bullets. The dealer deals one Bullet at a time clockwise to each player in turn. After this, one more Bullet is dealt and placed in the centre of the Table and this is called the Community Bullet. All these Bullets are dealt face-down. The player left of the dealer, who is called First-draw, now has a choice of “Declining” or placing five Bullet-marks (a fixed amount and called the “Amount to contest”) in his barrel. If he declines he does not “Contest the Round” and is called a non-contestant for that Round and is said “not to have Contested for the Round” - but this is not the same as withdrawing as he will have already placed five Bullet-marks for a Gun-hand. If he places the amount to contest of five Bullet-marks he is then contesting and is called a contestant and is said “to have Contested for the Round”. The player to the left of First-draw has the same choices as does First-draw i.e. to decline or to place the amount to contest of five Bullet-marks in his barrel, but in addition he can “Raise the Placement” by a further five Bullet-marks (only if First-draw has placed his five) and would then place ten Bullet-marks in his barrel. The next player to the left has a similar three choices as the previous player i.e. to decline and so not contest the Round or; to place the higher of the amount to contest or the previous placement (if any) of Bullet-marks (up to possibly ten) or; to raise the previous placement (if any) by a further five Bullet-marks (up to possibly fifteen). This process continues for each of the players and so the turn arrives back at the first contestant who will be the first player to the left of the dealer not to decline. Note - Raises here must be the same amount as the amount to contest - five Bullet-marks. The first contestant must now choose to match the highest barrel (if necessary, as there may not have been any raises) by placing the necessary Bullet-marks in his barrel or he must decline and not further contest the Round and he will be said to “not to have Matched for the Round”. This continues for each of the players in turn to the left and so the remaining contestants will then have equal sized barrels and are said “to have Matched for the Round”. Note that contestants may not increase their barrels beyond the amount of the aforesaid highest barrel. The Community Bullet is now turned face upwards and the remaining contestants can bid in an Auction to replace any one of their Bullets (that will be discarded face down) with the Community Bullet. The first choice of whether to bid or not is by the first remaining contestant to the left of the dealer and the first bid must be between five and ten Bullet-marks inclusive. Each contestant in turn to the left may make a higher bid by between five and ten Bullet-marks inclusive or state “No Bid” (though he may return to the Bidding later until the Auction is over). The Auction is over when all contestants state no bid consecutively after the winning bidder and then this winning last (and highest) bidder has the Community Bullet. The amount that the winning bidder has bid must be placed in his barrel and this is not returnable unless he wins the Round. Unsuccessful bidders do not have their bids placed in their barrels. Note - If the player holding the Community Bullet goes on to win the Round and the Community Bullet is the deciding factor in the win it is then known as “the Magic Bullet”. Note - A player can obtain the Community Bullet and then discard it (but see next note) as he may have wished to stop another player(s) from obtaining it - this could be critical in some situations. Note - A player obtaining the Community Bullet may also keep this together with his existing four Bullets and then if he participates in the Showdown - see below, he may select his four Bullet Gun-hand from his five Bullets - this could be a preferred alternative. Note - It is, I think, preferable for there to be a 'Community barrel' whereby the winning bidder in an auction places his bid in this. This separate barrel would be placed in the centre of the table and would be collected and emptied by the winner of the round and then put back (other barrels are placed in front of players). All barrels should be such that no confusion between them can arise. Note - The Community Bullet is also mentioned in Further thoughts. The next part (even if there are no bids in the Auction) of the Round is the same as the “Contest or Decline” part (and is here repeated) except that the placements are now double the amounts - the first remaining contestant to left of dealer (called First-draw) has a choice of declining and so not further contesting the Round or placing the fixed amount of ten Bullet-marks called “the Step-up amount” in his barrel. The player to the left of First-draw has the same choices as does First-draw i.e. to decline or to place the Step-up amount of ten Bullet-marks in his barrel and so “to have Stepped-up for the Round”, but in addition he can raise the placement by a further ten Bullet-marks (if First-draw has placed his ten) and would then place twenty Bullet-marks in his barrel. The next player to the left has a similar three choices as the previous player i.e. to decline and so “not to have Stepped-up for the Round” or; to place the higher of the Step-up amount or the previous placement of Bullet-marks, if any, (up to possibly twenty) or; to raise the previous placement (if any) by a further ten Bullet-marks (up to possibly thirty). Note - Raises here must be the same amount as the Step-up amount - ten Bullet-marks. The next part of the Round is the same as the “Match or Decline” part (and is here repeated) - the first contestant must now choose to match the highest barrel (if necessary, as there may not have been any raises) by placing the necessary Bullet-marks in his barrel or he must decline and so not further contest the Round and he is said to “not to have Re-matched for the Round”. This continues for each of the players in turn to the left and so the remaining contestants will then have equal sized barrels and are said “to have Re-matched for the Round”. Note that contestants may not increase their barrels beyond the amount of the aforesaid highest barrel. Note - An amount placed in a barrel by a winning bidder during the Community Bullet Auction must not be counted for either the Fifth Shot or Fifth Shot ricochet parts of the Round. The next and final part of the Round is that the remaining contestants show their Gun-hands and the player with the highest ranking Gun-hand wins the Round and all the amounts in the barrels on the Table (the Round’s Pool or Bounty). Play now proceeds to the next Round. The Reservist has some degree of authority over players with regard to enforcing the rules etc. and is the first point of any dispute etc. Also the Reservist can generally supervise a game and perhaps take the dealing of Bullets upon themselves and so forth. If at any time a player runs out of Bullet-marks and has already had his reserve plus interest issued to him then he must state Finish and miss the rest of the game. He should leave the Table and whatever Bullet-marks are in his barrel will go to the winner of the current Round. He does not owe any Bullet-marks whatever the situation.....but see Further thoughts - Various for updated rules in these situations called the Fallback rules. Although a Table initially consists of five to seven players plus a Reservist there may be more wishing to play at the Table and all these “Participants” (as they are called) will firstly decide upon who is the Reservist for the Table for the Day’s play (see Further thoughts - Various). This is decided upon by all those who wish to be the Reservist offering their Rates of Exchange with Currency for the purchasing and returning of Bullet-marks by players & the amount and level of simple Interest on players’ unissued reserves (a Table for these items follows). After a vote has determined who the Day’s Reservist will be for the Table, the initial five to seven players for the Table are then decided by High Bullet - by the Participants cutting the Bullets or drawing or being dealt a Bullet. The Reservist must manage and account for the Central Reserve for the Day’s play and he or she is not a player. A Reservist will often arrange and organise a day’s play (see Further thoughts - various). Each time a player reaches the set Interest level for a Round (see the Table that follows) then his reserve, if unissued, is credited from the Central Reserve with from one up to five Bullet-marks inclusive as interest and the records must be updated to show this and displayed to the Table. Crediting of interest does not involve a Currency exchange. The interest amount and level is fixed for the Day and can form excesses/winnings. Note that the Reservist receives any margin or bears any loss made by the Central Reserve. Also note that each time there are issues/allocations from or returns to the Central Reserve of Bullet-marks there is an exchange of Currency - but in contrast also note that since players’ reserve allocations are purchased at the beginning of a game there is no Currency exchange when or if the reserve plus any interest is issued to the player during a game. If a player runs out of Bullet-marks and has insufficient Currency to continue he can no longer participate in the Day’s play and is described as and could or should say “Finished for the Day”. The token Currency (Sterlings) has a “Median” exchange rate with Bullet-marks of one to one. At the conclusion of the Day’s last game at a Table all players including the game’s winner must return all their Bullet-marks to the Central Reserve for Currency and now the closing balance of Bullet-marks should be the same as the opening balance. The final steps of the Day’s play for a Table is to declare for all Participants their closing Currency balances, their opening Currency balances and then the differences as being their Currency Margins (or Deficits) for the Day’s play. The Participant with the highest Margin is then called the “Overall Winner for the Day” who can of course be the Reservist. Note that the highest Margin is actual and not percentage. Finally all Currency is then returned to the Central Reserve and the closing balance should be the same as the opening balance. Satellite game points are then scored as follows: three for the Overall Winner for the day, two for the player with the second highest margin with one for the player with the third highest margin and one Satellite nominal point is awarded for the player with the fourth highest margin - the Reservist can be any of these four. These points are not scored though if any of these has a deficit. It is possible of course to play Revolver with just Bullet-marks and without Chamber integrated, but if Satellite game/nominal points are scored/awarded then Chamber must be integrated and the official game rules played - if the game is simply described as Revolver the integration of Chamber would be assumed. Firstly for players purchasing Bullet-marks – The standard rate for the Reservist to charge for all players is the Median exchange rate of 1.00 Sterling for one Bullet-mark, but to cover his extra time and/or costs of arranging the central reserve etc. he may charge a small amount more but this must be authorised, or alternately he may choose to receive one Satellite nominal point instead - this award is additional and is not taken from the total of points scored/awarded for the day's play. 0.95 Sterlings for each Bullet-mark returned. 0.90 Sterlings for each Bullet-mark returned. 0.85 Sterlings for each Bullet-Mark returned. When a player Contests for a Round. When a player Matches for a Round. When a player Re-matches for a Round. Matching for a Round ensures a player can participate in the Auction. Re-matching for a Round ensures a player can participate in the Showdown. This interesting puzzle consists of twenty three balls of six different colours (4 of 5 and 3 of 1) that can be revolved by two sections of the puzzle and moved up and down at three places; the picture shows the required solution to the puzzle (unfortunately the puzzle is a little tatty now), it is perhaps as hard as the better known puzzle of Rubik’s Cube is to solve or possibly harder - it took me longer to solve this Ball-barrel Puzzle than Rubik’s Cube and I have also invented a variation of Rubik’s Cube called the Runich Dice, also not easy to solve I found, and this, and Rubik’s Cube, are talked of in Steps along the way of Chess. Flagship is a game that is based upon a game invented by Hubert Phillips called Naval War Game that is itself derived from the game usually called Battleships that is probably about a century old. Naval War Game can be found in Hubert Phillips 1961 book More Indoor Games for two Players (though originated earlier) and I agree with him when he says here that it is a fascinating game, and with Flagship I have tried to bring in additional excitement and tension, mostly by the introduction of Flagships and these could, at least to some extent, be considered as the equivalent of a ‘Royal piece’ in Chess. The rules are more complex than Blade or Revolver and a number of practice games may be required for Persons to familiarise themselves with the rules. What variation is played is decided by arrangement or by way of card or by rolls of dice or coin. 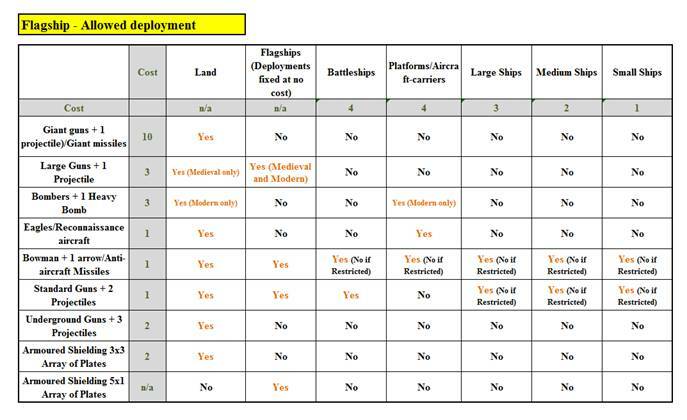 If the game is simply described as Flagship then this would be assumed to be the Modern, Free deployment variation. Two great powers have been at conflict with each other for control of major trade routes for as long as anyone can remember and sporadic clashes have occurred at Sea but these have not been decisive. The Kingdoms (see Further thoughts - Name changes etc.) of the two adversaries are widely separated by the Seas of Atlanta and this has led to a situation whereby there have been no Battles of any note occurring on Land, but both powers have steadily built up their Navies and have now set forth and occupied their areas of the Seas to attempt to cripple or destroy the other’s fleet in order to gain control of these trade routes. The object of the game is to score the higher number of Naval-marks and to sink the opposing Flagship - this wins the Battle (game). The board comprises of two Seas each of 15 x 15 squares that are separated by the Great Divide – an archipelago. 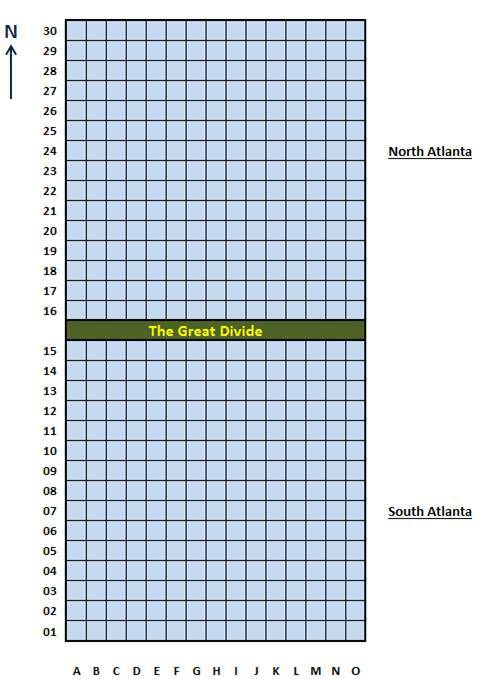 Admirals are not allowed, during deployment or play, to see each other’s board area (Sea) of North or South Atlanta and the Great Divide can be a screen to ensure this. Boards can be very large. Squares are usually called Positions or mostly so as Sectors. There are several ways to designate (locate) sectors, one (shown) is that files (Longitude) are designated A to O (west to east) and that ranks (Latitude, but excluding the Great Divide) are simply designated 01 to 30 (south to north). Longitude is stated first. The Great Divide is referred to by name but can in addition use Longitude designations. Although it is possible for Ships to move between North and South Atlanta the route is not straightforward and would leave Ships too open to attack in the situation and so the Battle takes place with the Ships at anchor. This section sets out the preliminaries to a game. Firstly what variation is to be played is decided along with who has first move and choice of sides (see Information Table). At the commencement of the game each Admiral (player) has 100 Chests of Currency issued to them by their Kingdom’s treasury to spend on their respective Navies that consist of ships, aircraft, ordnance and personnel and each Admiral must spend at least 40 but no more than 60 of these Chests on ships. After/alongside this spending the Admirals deploy their Navies’ various items (pieces) to their respective seas and also to their land areas as the Admirals also form such land as they require on their seas. After deployment the Admirals will take turns in the use of their Navies. Note that Platforms and Aircraft carriers are equivalents. Note that Giant guns and Giant missiles are equivalents as are Large guns and Bombers. Land may be entered (deployed, formed or placed) onto an Admiral’s sea at no cost and without limit as to the amount and placing except for the limits of the board itself and the deployment of ships. Land can be placed as blocks of 3x3 or 2x2 (shown below) and these blocks can adjoin one another or the edges and/or corners of the board. It is a requirement of all Admirals that they place some land blocks. Land positions can be described as occupied or unoccupied. Sea positions can also be described as occupied or unoccupied but if unoccupied are often called empty sea. After deployment is finished Land may not be removed or moved, added to or subtracted from for the rest of the game. Ships may be deployed on any empty Sea positions but may not adjoin or overlap other Ships and even their corners may not touch. Ships may however adjoin Land positions including any corners and adjoin the edges and/or corners of the board and they may be positioned horizontally or vertically but not diagonally. The number each side deploys of each denomination of Ship depends on their spending, except that each side has and deploys one Flagship. The positions a Ship covers are often called their sections and sections can be described as occupied or unoccupied or as undamaged or damaged. The significance of these three states is explained later. Sunken Ships are taken off the board. Damaged Ships have their damaged sections distinguished by being coloured grey instead of their undamaged colours (described later). If a particular section of a Ship is damaged more than once during the course of a game this does not change anything from when the particular section was damaged just once – if, however, all the sections of a Ship are damaged then the Ship sinks. Ships, other than a Flagship during the Primary engagement phase, may not be moved during either engagement phase (explained later) except to remove sunken Ships. Flagships, of that there is only one for each side, occupy five positions in a straight line that is stated as linear 5x1 (length x width). These Ships fly their side’s Naval Flag (fixed in their centres), though they are decorative only and have no cost. Flagships have no cost and also come (at no cost) with one Bowman/Anti-aircraft Missile situated in the centre section, also two Large Guns with projectiles are situated, one each, on the two sections next to the Bowman/Anti-aircraft Missile and two Standard Guns with projectiles are situated, one each, on the two end sections. In addition plates of Armoured Shielding are situated on each of the five sections of the Flagship. Nothing further than the above items may be deployed on a Flagship. In the Primary phase (explained later) this specific move is allowed to be made once during engagement. The move (often called changing the Flagship’s anchorage) is carried out by moving all five sections of the Flagship in unison one position either north, south, east, west, north-east, north-west, south-east or south-west i.e. eight possible moves. The resulting position must not infringe any rule such as those relating to Ships adjoining or touching, or plates of Armoured Shielding overlapping. Battleships occupy a linear 4x1 set of positions. 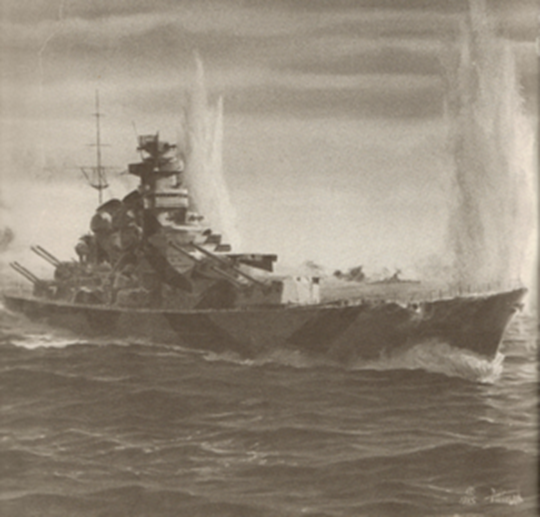 Battleships may have Standard Guns singly deployed on one or more of their sections and, if free deployment, may have Bowman/Anti-aircraft Missiles so deployed, but nothing else may be deployed on them. Floating platforms (can simply be called Platforms) and Aircraft carriers - these occupy a 2x2 set of positions and they may have Eagles (Spotters)/Reconnaissance aircraft singly deployed on one or more of their sections and, if free deployment, may have Bowman/Anti-aircraft Missiles so deployed and Aircraft carriers may have Bombers so deployed on them whether restricted or free deployment, but nothing else may be deployed on them. Large ships occupy a linear 3x1 set of positions and, if free deployment, may have Bowman/Anti-aircraft Missiles or Standard guns singly deployed to one or more of their sections, they may not have anything else deployed on them. Medium ships occupy a linear 2x1 set of positions and, if free deployment, may have Bowman/Anti-aircraft Missiles or Standard guns singly deployed to one or more of their sections, they may not have anything else deployed on them. Small ships occupy a linear 1x1 position and, if free deployment, may have a Bowman/Anti-aircraft Missile or a Standard gun deployed to their section, they may not have anything else deployed on them. Observers are, prior to the commencement of the game, situated on the Great Divide and they report on the happenings of the game, as described later. may also move personnel and other Navy items where required and count or assist in counting Naval-marks. There are several for each side and they also act as rescuers of any personnel including Eagles who need rescuing from the seas or land. do not actively and directly participate in the battle, however. must act with complete integrity when reporting etc. Note that Observers are required for any meaningful Game or Tournaments or Matches or suchlike. Eagles are also called Spotters and these creatures act as reconnaissance - note that there is no difference between these and the modern equivalents of Reconnaissance aircraft. These can be deployed singly on an unoccupied position of Land or singly on an unoccupied position (section) of a Platform or an Aircraft carrier. Each Eagle can only be used once during a game and if and when he is used the Eagle is dispatched to fly to a specified opposing position whereupon the exact and full dispositions of this position and all the adjacent eight positions are seen by the Eagle and reported to his Admiral via an Observer, unless he is shot down (see Bowmen/Anti-aircraft Missiles below). At deployment an Eagle is described as an undispatched Eagle and his wings are closed to signify this. When (if) he is dispatched then his wings are open and he is now (briefly) described as a dispatched Eagle. If the Eagle/Aircraft is then shot down by an opposing Bowman/Anti-aircraft Missile he is described as a downed Eagle/Aircraft and (being rescued by allied Observers) he is then placed on (or around) the Great Divide together with the arrow/missile that he was shot down with and he plays no further part in the game. If the Eagle/Aircraft is not shot down then he reports his information to an allied Observer and lands on the Great Divide as a spent (tired and exhausted or out of fuel if an Aircraft) Eagle and his wings are now closed and he plays no further part in the game. Eagles may not be moved during what is called the Primary engagement phase (explained later) of the game except as described above or described later. If deployment is restricted these can only be deployed singly on an unoccupied position of land (but see Flagships), or if free deployment also singly deployed on any other ships on unoccupied sections. A Bowman has a long-range Bow with only one exceptionally long and accurate arrow in a quiver. Each Bowman can only be used once during a game and this occurs if and when an opposing Eagle is dispatched to his position or any of the adjacent eight positions to this. The Bowman can then shoot down the Eagle (with an arrow through the wing) and so the dispositions that the Eagle would or might have seen are not reported. The Bowman’s Admiral may, however, choose not to use the Bowman and so may allow the Eagle to return and report dispositions as described above (that would include the positioning of the Bowman). The Bowman is then still available for possible use on a later turn. At deployment a Bowman is described as an armed Bowman and this is signified by his quiver containing his one arrow. When and if he has shot down an Eagle then he is described as an unarmed Bowman and this is signified by his quiver being empty – an unarmed Bowman retires from the Battle and moves to the Great Divide and plays no further part in the game. Bowmen may not be moved during what is called the Primary engagement phase (explained later) of the game except to move them to the Great Divide as described above or described later. Deployment of these is the same as for Bowmen. These missiles can only be used once in a game if and when an opposing Reconnaissance aircraft or a Bomber (note the difference to a Bowman) is dispatched to the missile’s position or any of the adjacent eight positions to this. The missile can then shoot down the aircraft and so the dispositions are not reported, as with Bowman, or the Bomber does no damage. As with Bowman however, the Admiral may choose not to use an Anti-aircraft Missile. Anti-aircraft Missiles may not be moved during what is called the Primary engagement phase (explained later) of the game except to take them off the board when used or to move them to the Great Divide as described later. The Guns fired in the course of the Battle are built to fire at very long ranges with accuracy. This requirement causes great stresses to the guns when being fired and so they can only fire one or a very few projectiles before becoming damaged and inoperable (apart from Repeating Guns). After being deployed Ordnance items may not be moved during the game except when removing them from the board as described below. There is some repetition in the following descriptions. These are the largest guns/missiles in the battle but they are not nuclear. An Admiral may not purchase more than three of these guns/missiles and they can only be singly deployed to an unoccupied Land position. Each gun comes with one projectile. Against such huge projectiles/missiles plates of Armoured shielding (explained later) are of no protection to whoever or whatever occupies the positions and the plates are wrecked and are of no further use and unrepairable. Wrecked plates are, then, thrown into the sea (taken off the board). Any undispatched Eagles are badly wounded and totally incapacitated as are any armed Bowmen and these Personnel are rescued by allied Observers and taken to the Great Divide. They are, then, placed on (or around) the Great Divide and described as badly wounded Personnel and they play no further part in the game. Reconnaissance aircraft and Anti-aircraft Missiles are rendered inoperable and are also placed on or around the Great Divide. Any Ship’s sections are damaged and as already stated once all of a Ship’s sections are damaged the Ship sinks. Any Personnel or items of Ordnance occupying these sections suffer the same fate as those occupying land positions. Giant guns/Giant missiles, Large guns/Bombers and Standard guns (but not Underground Guns), are severely damaged and unuseable and unrepairable as are any of their projectiles or bombs. These are cleared from the area and thrown into the sea (taken off the board). At deployment a Giant gun is described an operable and this is signified by its nearby projectile. After firing its projectile (that is then removed from the board) the Gun is described as inoperable and is moved to the Great Divide for possible salvage and plays no further part in the game. Large guns are somewhat smaller than Giant guns and they and their projectiles are not specially made as are Giant guns. Large guns can only be singly deployed to an unoccupied land position (but see Flagships). Each Large gun comes with one projectile. Any positions that are protected by plates of Armoured shielding have no damage done to whoever or whatever occupies them, but these plates themselves are severely damaged and are of no further use and unrepairable. Damaged plates are, then, thrown into the Sea (taken off the board). Any undispatched Eagles are wounded and totally incapacitated as are any armed Bowmen and these Personnel are rescued by allied Observers and taken to the Great Divide. They are, then, placed on (or around) the Great Divide and described as wounded Personnel and they play no further part in the game. Reconnaissance aircraft and Anti-aircraft Missiles are rendered inoperable and are also placed on or around the Great Divide. At deployment a Large gun is described as operable and this is signified by its nearby projectile. After firing its projectile (that is then removed from the board) the Gun is described as inoperable and is moved to the Great Divide for possible salvage and plays no further part in the game. They can also be singly deployed to an unoccupied Aircraft carrier section as well as that on land. They can be shot down by an Anti-aircraft Missile as already described. The bomb they carry is a heavy one and Armoured shielding is no defence and so the resulting damage is as that of a giant gun/Giant missile except that the devastated positions are 3x3 centred around where the bomber is dispatched to and not 5x5. Standard guns are considerably smaller than Large guns and they and their projectiles are widely made. Standard guns can be singly deployed to an unoccupied Land position or singly deployed to an unoccupied section on a Battleship (but see Flagships), or if free deployment, deployed so on large, medium or small Ships. Each Standard gun comes with two projectiles. A Standard gun can fire one or two projectiles on a turn as decided by the Admiral and if firing one projectile then the remaining projectile can be fired at a later turn. Any unprotected undispatched Eagles are wounded and totally incapacitated as are any unprotected armed Bowmen and these Personnel are rescued by allied Observers and taken to the Great Divide. They are, then, placed on (or around) the Great Divide and described as wounded Personnel and they play no further part in the game. Any unprotected Ship’s sections are damaged and as already stated once all of a Ship’s sections are damaged the Ship sinks. Any Personnel or items of Ordnance occupying these sections suffer the same fate as those occupying Land positions. Any unprotected Giant guns/Giant missiles, Large guns/Bombers and Standard guns (but not Underground Guns), are severely damaged and unuseable and unrepairable as are any of their projectiles or bombs. These are cleared from the area and thrown into the sea (taken off the board). At deployment a Standard gun is described as an operable Standard gun and this is signified by its nearby projectiles. After firing both of its projectiles (that are removed from the board as and when fired) the Standard gun is described as an inoperable Standard gun and is moved to the Great Divide for possible salvage and plays no further part in the game. These are of a similar size to Standard guns though they and their projectiles are not widely made and are somewhat rare. As their name suggests they are situated underground but are raised to the surface when firing; after firing they are retracted back to their underground position where they are safe from attack or damage by any Naval item, even Giant guns/Giant/missiles; they can, however, be detected and reported by dispatched Eagles whose sharp eyes can see the signs of Underground guns even if covered by Armoured shielding and they can also be detected by Reconnaissance aircraft as they have the equipment to do this. Underground guns can only be singly deployed to an unoccupied Land position. Each Underground gun comes with three projectiles. An Underground gun can fire one, two or three projectiles on a turn as decided by the Admiral and if firing one or two projectiles then the remaining projectile or projectiles can be fired at a later turn(s). At deployment an Underground gun is described as an operable Underground gun and this is signified by its nearby projectiles that are stored with the Gun. After firing all of its projectiles (that are removed from the board as and when fired) the Underground gun is described as an inoperable Underground gun and is moved to the Great Divide for possible salvage and plays no further part in the game. This consists of nine armoured plates that are in a 3x3 interlinked array. Armoured shielding can only be deployed to Land positions that may be occupied or unoccupied (but see Flagships). The position of deployment is the centre of the 3x3 position array and must be such that plates do not overlap with the plates of other Armoured shielding that have been deployed (or are situated on a Flagship) – their method of construction prevents this. It is allowed for the deployment position to be on the edge or corner of Land blocks and so plates can extend to cover Sea positions and therefore protect sections of Ships and their occupants (whether Personnel and/or Ordnance and also Aircraft). If the positioning of the array is such that nine positions are not covered (for example the edge of the board) then there is no compensation for this - this point would also apply to other situations e.g. the firing of a Giant missile or a Large Gun etc. It is not allowed to deploy individual plates – they are made at an economical array size and they are impractical to break up and so the array as a whole must be deployed. Flagships however come already with a special array of 5x1 plates covering each of their five sections. The use of Armoured shielding as protection is automatic and an Admiral does not have the option to defer their use to a later turn as he does with e.g. a Bowman. The use of Armoured shielding does not constitute an Admiral’s turn of play. As already described a plate of Armoured shielding can only be used for protection once and whoever or whatever was protected on the position or section is then not protected any more. In many situations not all of the plates in an array are used, for example there may be several hits on plates in an array by an Underground gun or a Large gun but the remaining plates in the array that are not hit can still be used. As already stated Armoured shielding cannot protect against the projectiles of a Giant gun, a Giant missile or a Heavy bomb. Also a dispatched Eagle or Reconnaissance aircraft can see and report what a plate protects as well as see and report the plate itself. The following lists every item that is protected from damage or wounding if a plate of Armoured shielding covers the position or Ship’s section they are occupying. Projectiles/bombs are also protected. Where an item can fire more than one projectile on an Admiral’s turn, e.g. a Standard gun, then if the first and second projectiles are directed to the same position (or section) and that position is covered by a plate of Armoured shielding, then the first projectile would be protected against but not the second, and any occupant of the position would then be damaged or wounded. As can be seen, any position (Land or Sea) or Ship’s section can be described as protected or unprotected. Plates of Armoured shielding are not classed as occupants of positions or Ship’s sections as are other items of Personnel or Ordnance or Aircraft. These are deployed and used only if there is a Secondary Phase (explained later) in the Battle and so they are described later. is off the board so far as the deployment, use and capabilities of the Naval items are concerned except for what is specifically described. During this stage each Admiral decides how he will spend his 100 Chests of currency on the available Naval items and how he will deploy the Ships, Personnel and Ordnance and Aircraft that he purchases. Also he will decide where to place Land blocks and where to deploy his Flagship. The Admiral may be assisted during this stage by his Captain. During this stage it is not allowed for an Admiral or Captain to see their opponent’s board (Sea) or to obtain any information as to their opponent’s activities. After both Admirals have completed their spending and deployment the game moves to the engagement stage and each Admiral will take alternate turns in the use of their Naval items. During this stage an Admiral is not allowed to be assisted by his Captain and neither an Admiral nor a Captain is allowed to see their opponent’s board (Sea) or to obtain any information other than what is properly reported. On his turn, before an Admiral can take an action (listed below) himself, he must first take into account and put into place the effects (if any) on his own Navy of the action of his opponent’s immediately preceding turn. To dispatch an undispatched Eagle/Reconnaissance aircraft to an opponent’s board (Sea). The Admiral must choose a specific Eagle/Reconnaissance aircraft. To shoot down a dispatched opposing Eagle/Reconnaissance aircraft with an armed Bowman/Anti-aircraft Missile. The Bowman/Anti-aircraft Missile must be a specific one. To fire an operable Giant gun or fire a Giant missile. The Admiral must choose a specific Giant gun/Giant missile. To fire an operable Large gun. The Admiral must choose a specific Large gun. To dispatch an undespatched Bomber to an opponent’s board (Sea). The Admiral must choose a specific Bomber. To shoot down a dispatched opposing Bomber with an Anti aircraft missile. The Anti-aircraft Missile must be a specific one. To fire an operable Standard gun. The Admiral must choose a specific Standard gun. To fire an operable Underground gun. The Admiral must choose a specific Underground gun. To move (change the anchorage of) the Flagship. This is allowed only once and only during the Primary phase - engagement. If all the Ships of one of the Navies are sunk then the phase, and the game, immediately ends and an Admiral must state all his Ships are sunk immediately this is so. If there are four successive statements of “No Action” involving both Admirals then the phase ends. Ships that are afloat and undamaged are awarded one Naval-mark for each of their sections and so, for example, an undamaged Large ship is awarded three Naval-marks. Ships that are afloat but damaged are also awarded one Naval-mark for each of their sections including the sections that are damaged. For example a Battleship may have three of the four sections damaged but would still remain afloat and would be awarded four Naval-marks. Ships that have been sunk are not awarded any Naval-marks and have already been taken off the board. The total number of Naval-marks awarded are added up for each Navy and the winning Admiral (player) is the one whose total is the higher and he has won the Battle (game) unless the Admiral with the lower number of Naval-marks still has his Flagship afloat, even if (and however much) damaged. In this situation the game moves to the Secondary phase and the Primary phase is described as inconclusive. 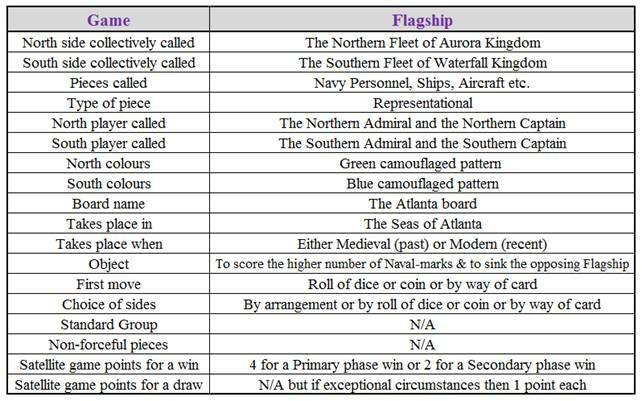 If the total number of Naval-marks awarded is the same for each Navy, regardless of whether either Flagship is afloat or not, then the game moves to the Secondary phase and the Primary phase is also described as inconclusive. As can be seen, an Admiral whose Ships have all been sunk will have lost the Battle as he will have no Naval-marks or Flagship afloat whilst his opponent will have at least one Naval-mark and it is not a requirement to have one’s Flagship afloat in order to win the game. During the counting, until and unless there is a winner, nothing of the counting is reported or stated except that if there is no winner the game will move to the Secondary phase. Admirals and Captains are still not allowed to see their opponent’s board or to obtain any information and a Captain is not allowed to assist his Admiral. It is restated that it is not necessary to have one’s own Flagship afloat in order to win the Battle. To sum up the requirements for a win at this stage are that an Admiral needs to have been awarded the higher number of Naval-marks and to have sunk his opposing Admiral’s Flagship, or of course to have sunk all his opposing Admiral’s Ships. Land remains positioned the same as in the primary phase and as already stated may not be added to, removed or moved. Sunken Ships remain sunk and so play no part in the Secondary phase. All unused Bowman/Anti-aircraft Missiles (including any still on board any surviving Flagship), plates of Armoured shielding etc. are moved to the Great Divide (if not already there) and play no part in the Secondary phase. Each Navy has one Repeating gun (explained below) allocated to them (at no cost) that is placed on any Land position and is then situated underground. This second deployment or re-deployment of (the surviving) Ships follows the same rules of Ship deployment as already explained for the Primary phase deployment and when completed each Sea (board) will only have placed on it unoccupied and undamaged Ships and unoccupied Land except for one Repeating gun placed on a Land position from where it cannot be moved. There is no protection from Armoured shielding as this will have all been removed. Any Flagship now only differs from other Ships by its greater size and its (decorative only) Flag. An Admiral may be assisted by his Captain during this stage. During this stage it is not allowed for an Admiral or Captain to see their opponent’s board (Sea) or to obtain any information as to their opponent’s activities. is similar to an Underground Gun except that these Guns remain operable for very long and sustained use – sufficient for the remainder of the Battle (game). They are completely safe from damage by the projectiles of another Repeating gun and on each turn they fire three projectiles. Each of these projectiles can damage a Ship’s section and as already stated once all of a Ship’s sections are damaged the Ship sinks. These Guns are made with the utmost precision and are exceedingly rare. The projectiles are stored and fed into the gun from deep underground and do not appear on the board. There are sufficient projectiles for the remainder of the Battle (game). After both Admirals have completed their re- deployment the game moves to the Secondary engagement stage and each Admiral will take alternate turns in the firing of their Repeating guns to specified opposing positions. During this stage an Admiral is not allowed to be assisted by his Captain and neither an Admiral nor a Captain is allowed to see their opponent’s board (Sea) or to obtain any information other than what is properly reported. Firstly putting into place the effects, as described above (if any) of the three projectiles that have been fired by his opponent on the opponent’s immediately preceding turn. Reporting as required (explained below). Firing his own gun’s three projectiles. The Admiral must state specific opposing destination positions for the three projectiles that are fired. The Secondary phase – engagement stage, and the game, ends immediately when, but not before, all the Ships of one of the Navies are sunk. As can be seen, the object during the Secondary phase - engagement is to sink all the opponent’s Ships before he sinks all of one’s own Ships. At the end of the Secondary phase – engagement stage there is a Final counting of Naval-marks (so as to have a complete record) where the principles of awarding Naval-marks is the same as for the first counting and the Admiral with one or more Ships still afloat wins the Battle – the Admiral with all his Ships sunk will obviously have no Naval-marks. The Naval-marks awarded during the First counting are disregarded and not taken into account for the Final count. This section sets out the various reporting requirements of the game. There are requirements to state information at various stages of the game and the following lists when and what must be stated or disclosed. There is some leeway with the actual wording but the information stated must meet the substance of the requirements. As already stated an Admiral must state that all his Ships are sunk immediately this happens. When dispatching an (undispatched) Eagle/Reconnaissance aircraft an Admiral must state that he is dispatching an Eagle/Reconnaissance aircraft and to the specific position in his opponent’s board that the Eagle/Reconnaissance aircraft is being dispatched to. He does not have to state the position the Eagle/Reconnaissance aircraft is dispatched from. When an Admiral shoots down an Eagle/Reconnaissance aircraft with an (armed) Bowman/Anti-aircraft Missile he must state that the Eagle/Reconnaissance aircraft has been shot down by a Bowman/Anti-aircraft missile. He does not have to state the position the Bowman/Anti-aircraft Missile is occupying. When firing an (operable) Giant gun/Giant missile an Admiral must state that he is firing a Giant gun/Giant missile and to the specific position in his opponent’s board that the Gun’s projectile or the Giant missile is being fired to. He does not have to state the position the Giant gun is occupying or the Giant missile is fired from. When dispatching an (undispatched) Bomber aircraft an Admiral must state that he is dispatching a Bomber and to the specific position in his opponent’s board that the Bomber is being dispatched to, this being where the Heavy bomb falls. He does not have to state the position the Bomber is dispatched from. When firing an (operable) Large gun an Admiral must state that he is firing a Large gun and to the specific position in his opponent’s board that the Gun’s projectile is being fired to. He does not have to state the position the Large gun is occupying. When firing an (operable) Standard gun an Admiral must state that he is firing a Standard gun and to the specific one or two positions in his opponent’s board that the Gun’s one or two projectiles are being fired to. He does not have to state the position the Standard gun is occupying. When firing an (operable) Underground gun an Admiral must state that he is firing an Underground gun and to the specific one, two or three positions in his opponent’s board that the Gun’s one, two or three projectiles are being fired to. He does not have to state the position the Underground gun is occupying. When moving a Flagship an Admiral must state that he is moving (or changing the anchorage of) his Flagship. He does not have to state either of the from or to positions. When firing his Repeating gun an Admiral must state that he is firing his Repeating gun and to the specific three positions in his opponent’s board that the Gun’s three projectiles are being fired to. He does not have to state the position the Repeating gun is occupying. Note – In the Secondary phase, information regarding Personnel, Armoured shielding etc. will not be required as these are no longer on the board. Note – Type of position can be Land, Sea or Ship’s section (damaged or undamaged), occupied or unoccupied, protected or unprotected (by Armoured shielding). The number of plates of Armoured Shielding that have been wrecked or severely damaged. He does not have to state the positions that they covered or the type of positions. The number and denomination of Guns/Giant missiles that have been severely damaged. He does not have to state the positions that they occupied or the type of positions. The number of Bombers that have been severely damaged. He does not have to state the positions that they occupied or the type of positions. The number of (undispatched) Eagles/Reconnaissance aircraft that have been wounded or badly wounded or severely damaged. He does not have to state the positions that they occupied or the type of positions. The number of (armed) Bowmen/Anti-aircraft Missiles that have been wounded or badly wounded or severely damaged. He does not have to state the positions that they occupied or the type of positions. The number and denomination of Ships that have been sunk. He does not have to state the positions that these Ships occupied or the type of positions, or how much damage, if any, they had previously sustained or how many new “hits” occurred. The number of undamaged sections now damaged on Ships that are still afloat and what the Ships’ denominations are. This must be stated for each individual Ship that has had damage inflicted on it. The Observer or Admiral does not have to state the positions that these sections occupied or the type of positions, or whether the sections were occupied or unoccupied, or how much damage, if any, their Ships had previously sustained or now have. The designation (location) of the position and whether Land, Sea, or a damaged or undamaged Ship’s section and the denomination of Ship - he does not have to state the particular section of the Ship the section is (e.g. centre section of the Flagship or end section of a Battleship). Whether or not the position is occupied and if so exactly who or what is the occupant. The description of the occupant must be full e.g. a Gun described as Large or Standard etc. and, if relevant, the number of projectiles still unfired. Whether or not the position is protected by a plate of Armoured shielding. He does not have to state the position in its array the plate is. Although the number of Naval-marks awarded to each Admiral is crucial in deciding who the winner of the game is, the actual Game Points scored by the winner do not depend on how many Naval-marks are awarded to the winner or the margin of the win. For a Primary phase win the Satellite Game Points score is 4-0 to the winning Admiral. For a Secondary phase win the Satellite Game Points score is 2-0 to the winning Admiral. Any Game points shared in by a winning Captain is a matter for agreement between him and his Admiral. An allied Observer may relay to the opposing Admiral statements on actions taken by his own Admiral. An allied Observer may relay and report to his Admiral the full and exact dispositions seen by their dispatched Eagles/Reconnaissance aircraft. An allied Observer may put into place the effects and damage (if any) resulting from the immediately preceding turn of the opposing Admiral. An opposing Observer may then report the effects and damage (or state there were none) to his own Admiral. An allied Observer may rescue any badly wounded or wounded Personnel from Sea, Land or Ships including downed Eagles and move them to the Great Divide. An allied Observer may move any Personnel to the Great Divide where required as described. An allied Observer may remove sunken Ships from the board or remove Ordnance or Aircraft. from the board (or move to the Great Divide) where required as described. Observers may assist in the countings of Naval-marks. Observers may fully record a game and if not, any Arbiter or Referee may do so. Boards can be very large and Ships and other items should be realistic and are 3D. There can be suitable audio effects, for example the sounds of Guns firing. All wounded and badly wounded Personnel including downed Eagles make a full recovery. Aircraft are manned and these Personnel also make a full recovery if wounded or badly wounded. If preferred Giant guns instead of Giant missiles can also be used for the Modern variations as there is no practical difference between them and the Guns can be visualised in different ways for the variations. Primary phase – spending and deployment. A single clock will have say 90 minutes entered on it that will count down to zero and if an Admiral has not then completed his spending and deployment he will be allowed no more of such, though he does not lose the game on time . Any unused time on this clock is not carried forward. Primary phase – engagement. Both Admirals now have a clock each and have say 90 minutes entered on each of them. These clocks will count down and if a clock reaches zero then that Admiral can take no further actions himself for this stage, though he does not lose the game on time. First counting of Naval-marks. This should be completed within a reasonable time without the need to use a clock. It is allowed though to re-set the single clock with say 30 minutes entered on it as this counting should not be rushed. Any unused time on this clock is not carried forward. Secondary phase – repair and re-deployment. The single clock is re-set with say 30 minutes entered on it that will count down to zero and if an Admiral has not then completed his re- deployment he will be allowed no more of such, though he does not lose the game on time . Any unused time on this clock is not carried forward. Secondary phase – engagement. The individual clocks of each Admiral have say 30 minutes entered on each of them plus any unused time from the Primary phase – engagement stage. These clocks will count down and if a clock reaches zero then that Admiral can take no further actions and loses the game on time. Final counting of Naval-marks. This should be completed within a short time without the need to use a clock. It is allowed though to re-set the single clock with say 15 minutes entered on it as there should be no rush to complete this. Suitable amounts of time lagging should be set where appropriate to allow for such things as physical movements when removing sunken Ships from the board etc. Note that Independent single countdown clocks as described in Steps along the Way of Chess are set for any meaningful game of Flagship. It is allowed for each Admiral to have an additional board to plot such information as he properly obtains concerning his opponent’s dispositions. Before a game commences Admirals must roll a standard dice or coin to decide who takes the first turn in Primary engagement, or they can decide this by way of card. The winner of this takes the first turn and it is not allowed for this Admiral to state “No action” on his first turn. If there is a Secondary phase then the Admiral who moved second in Primary engagement takes the first turn in Secondary engagement. There is nothing to prevent an Admiral from repeatedly firing to the same position(s) inadvertently. Note that an appointed Captain is Captain of the relevant Flagship and is master of this, his own Ship, and although the decision to change the anchorage of a Flagship is that of an Admiral, the actual move itself.....(or not, if the Captain so decides – in this case another action is taken or no action is taken as decided by the Admiral).....is decided by the Captain and not the Admiral; this is if a Captain has been appointed (there usually should be); the Admiral states the fact of any change of the Flagship’s anchorage though. It is not necessary to appoint a Captain or to request his assistance if there is one, however, as stated it is preferable to have a Captain appointed. Should a Captain at any stage see the opposing board or obtain information he should not have, then he should not assist or consult any more with his Admiral. The deployment and purchase table at the end summarises what can and cannot be purchased under each variation and where they can or cannot be deployed and the unit cost is also given. Note that the following specifications are approximate only (see Further thoughts - various), and that all weights and measures are Imperial. Sixthly the ordinal number is delineated when finished and in the above this is. Note that spaces are not allowed and that case sensitivity applies. Although the thickness of armour is much increased (mostly by a foot) by the use of improved materials - see Note 1, these materials do not increase weight since they are lighter than those of the MK1s, but they are much stronger overall in the requirements of the Ships’ protection. No personnel have so far been appointed for any of these Ships and there will be no appointments whatsoever without the most exhaustive of examinations. Note also that for these Seaships and Giant guns there will be built, it is hoped, at the most pains-taking efforts, one-twentieth scale remote controlled models, and that these models will be visually accurate in every respect, and that many of the constituent parts will indeed function as does the actual Seaship itself, and some very advanced technology with regard to the Ships’ aircraft, it is hoped, will enable their realistic flight. At some stage there will be, hopefully, a commercial manufacture of smaller models. In Blade the format name of Duplicate could be changed to Corresponding. In Revolver the Central Reserve could be called the Treasury or the Bank. In Revolver the name of the Reservist could be the Treasurer or the Bursar. In Revolver the hand name of Match may be changed - perhaps to a Pair. In Revolver the name of the Fourth Shot, being the Community Bullet, could be the Auction if preferred. The names of the Kingdoms in Flagship may be changed. The words/phrase 'The Diamond Set™' or 'The Diamond Set' (not necessarily as a trademark and 'A' can replace 'The' here) may be used in some way (diamonds are, as is well known, one of the suits of a current standard pack of cards) and they are reserved for use by the Author - these phrases are also mentioned in Further thoughts in Steps along the way of Chess. The above listing does not however take into account the possibilities and probabilities (chances) of improvement to a hand by a player obtaining the Community Bullet and a knowledge of these chances could be of considerable benefit to a player.....also it should, I think, be said that whereas the probability of being dealt a rank of hand is known and that the cost to be dealt a hand is known, and in addition the chances of various and/or overall improvements to a hand by means of the Community Bullet can be determined and known, the cost of improvements is not so readily determined as a player must, after paying to reach there, win the Auction if he is to improve his hand (or perhaps to prevent others from doing so), and the costs of this vary as reaching and then bidding in the Auction does not have a fixed limit and unless he has more stakes (Bullet-marks) available than other players he cannot guarantee winning, though he may still do so depending on the bidding and, if he does win, he then has less stakes available to continue the round with. Also since winning Auction bids are only returned if the bidder wins the round, the cost of improvement means the holder of an improved hand has effectively placed stakes that are higher than other players - see rules on 'Shots'. As an example: a player dealt two Marshalls may consider he has a reasonable chance of winning the round and so may pay to continue to the Auction where he may decide to bid strongly, if necessary, to improve his own hand - if this is possible as it depends on his exact Bullets and what the Community Bullet is, or he may decide to bid strongly, if necessary, to prevent any others from improving their hand (other players may also be bidding to prevent improvements by their opponents as well as to improve their own hands, or they could be bluffing); then a) if he cannot stay with the Auction bidding but wins the round then he would win the amount bid by the winner in the Auction in addition to other stakes placed - perhaps a bonus round or b) if he wins the Auction and goes on to win the round then his Auction costs are returned and he also wins other stakes placed or c) if he cannot stay with the Auction bidding and loses the round he will lose his stakes placed or d) if he wins the Auction but loses the round he loses his Auction bid as well as his stakes placed - perhaps a costly round. The assumption has been made that the player has sufficient stakes to continue to the Showdown. It should be added that the Auction gives scope for bluffing, and bluffing is considered an essential part of Poker type games. The inconsistency here between the frequency and ranking of some hands is perhaps not too much and so this alternative might be be considered as acceptable by some, but I think this must await considered opinion and this ranking is not official until and unless authorised by myself to be so - were it to become so then whether the Statistical or Traditional ranking of hands applied to a game would have to be made known and preferably displayed to players. Secondly the Auction and the eligibility of a player to win the Community barrel under these rules are talked of separately. In connection with the previous note, a player is only eligible to bid in an Auction if he has placed the required stakes to Match for the round and so paid to reach the Auction (this can be called the Part Auction eligibility rule) - Optional rule (this can be called the Full Auction eligibility rule) here he must also stand to lose all his placed stakes at this point in the round (prior to any possible Auction bid) meaning at least one other player has Matched for the round (even were this player later to decline - this would be his choice and he would not have to do so if any player had initiated the Fallback rules before the Auction, also see General notes and further rules) - players must be made aware of what Auction eligibility rule is in effect, and in time it may be that one of the rules becomes standard or that having the option remains as standard. In connection with the previous note an Optional rule (this can be called the Reserve fallback rule) can be applied where a situation arises that would require a player to place more than all his stakes including if his (unissued) reserve plus interest were issued in order to continue in the round, and so he would have to decline. This situation, perhaps rare, could arise for example if, after the Auction, five players were to raise the stakes after the first player Stepped-up for the round, here there would be sixty Bullet-marks required if any seventh player were to continue and if he could not meet this amount even including his reserve plus interest then under this rule he could request his reserve plus interest be issued and place this together with any other stakes he has remaining (if any) and initiate the Fallback rules (he can state Reserve fallback - note he would still have less than sixty Bullet-marks placed). This rule may become standard, and players must be made aware if this rule is in effect by informing them that the Reserve fallback rule is in effect or is not in effect. It should perhaps be added that with six players or less at a table such a situation may not arise. In Revolver a Reservist (or Treasurer or Bursar if so called) may organise a day's play themself, but to do this the person would need to be authorised to do so and would need to have proven good experience. In Revolver the rules on a player choosing to be a Leaver for the game (see the First shot in Revolver) may well be revised with a view to imposing restrictions for this. Overall maximum and minimum numbers for Revolver may be set. The assumption in Flagship that if the game is simply described as Flagship then this means the variation is the Modern, Free deployment variation may be changed to the Modern, Restricted deployment variation or possibly one of the Medieval variations - extensive playing of the game would be required to determine the optimum, and so assumed, variation. 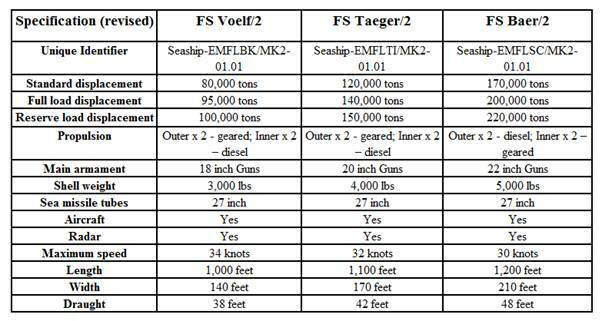 In Flagship the specifications for the mark two modern Flagships will need to be revised upwards and some approximate initial revisions are shown in brackets and in an additional summary table - these revisions will be firmed up at some stage. 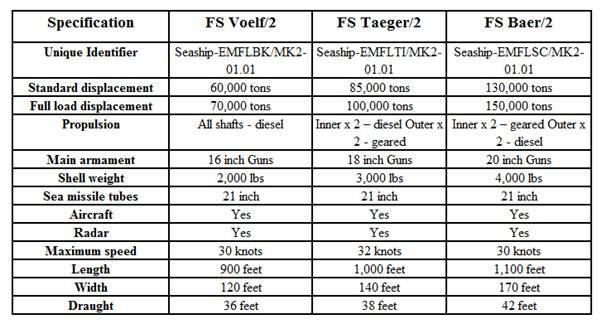 The additional figures shown and called 'Full load displacement with optional reserve supplies' may be more usually called 'Reserve load displacement' for short.....Giant guns will also have revised figures as the size has significantly increased and initial revisions will be shown at some stage. Though the rules for Blade and Revolver state that clocks are not usually used this may well be changed so that any referee of these games or the reservist in Revolver can decide when to issue a time countdown warning, and here an hourglass could be displayed with an appropriate amount of time on it. Hourglasses are talked of in Steps along the way of Chess in timing of games and a picture of one is shown there. The story based on the JRR Tolkien books has some puzzles etc. in it and game players sometimes find these things interesting, and the book gives a simple listing of these in the section called 'Ends'. Tournaments are basically where a number of players enter such to play a series of a specific game or variation thereof and at the end of the tournament there are placings according to the results of the entrants. The playing of tournaments (or drives) in Blade would likely have their own scoring system with likely only the highest placed entrants (perhaps only the top three or four) receiving points over and above those already scored as described, but these additional points (probably to be called Tournament bonus points) could be of a relatively large amount depending on the number and strength of entrants and the number of games played - such tournaments would often last for at least a day. The format and details or a template for these tournaments may, at some point, be written as a separate heading. Reference to other puzzles etc.